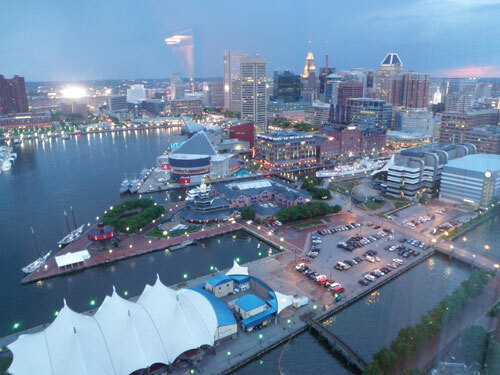 I drove up and down the east coast of this fine continent last weekend to attend the FitBloggin’ conference in Baltimore. It was a weekend for superlative moments, that’s for sure, which is why I made a list of them. JenFul: Where are you from? JenFul: I lived there when I was at the University of Kentucky! Skinny Emmie: I went to UK, too! JenFul: Did you live in a dorm? Skinny Emmie: Yes, Boyd Hall. JenFul: SHUT THE FRONT DOOR! *I* lived in Boyd Hall. What years? Skinny Emmie: I started in 1999. JenFul: GET OUT! I lived there from 1998-2000. JenFul: We lived in the same dorm at the same time! I was on the second floor. Skinny Emmie: I was on the fourth! Do you know So Anne So? JenFul: I went to high school with So Anne So! We also figured out that we were both getting fat off of the same selection of Ben & Jerry’s available at the Blazer Xpress at the same time. And she ran out of money on her meal card before the end of the semester too. So, it wasn’t just me! Giving my Design 101 presentation without breaking into splotches. That’s the calm, cool, competence that only comes with assembling your presentation three days in advance. Realizing I gave my entire Design 101 session with my fly open. Thank goodness for long shirts and dark undies! Following my friends two blocks in one direction and then backtracking to find a restaurant across the street from the hotel. You can give a pack of bloggers smartphones and Google Maps, but you can’t make them use ’em! I stopped at a Starbucks when I was driving home so I wouldn’t fall asleep at the wheel. The women’s bathroom was occupied, so I looked to make sure no one was watching…and then I used the men’s bathroom. No, I don’t have a secret I need to tell you. When you gotta’ go, you gotta’ go, but you’d better go before anyone sees you went. The five-and-a-half-hour drive to Baltimore and the six-hour drive back to Chapel Hill wasn’t that painful. I was expecting to faceplant onto my bed with a wicked headache by the end of both trips, but the drive wasn’t that bad and the headache behaved. My four-and-a-half hour trips to my old headache clinic usually hurt more, but maybe that’s because Indiana’s scenery is, um, kinda boring. Sorry, Indiana, but we both know it’s true. Seeing a Megabus broken down on the side of the highway on the drive home. It’s the third time I’ve seen that, but the first time I haven’t been on one! Dear disgruntled passengers, I have totally been there, and I’m so, so sorry. If I could have given you all a ride down the road in my tiny Saturn, I would have. While I was sitting on the highway in the DC area, amazed and annoyed that there could be rush-hour-like traffic on a Sunday, a SUNDAY, little did I know that Jen, aka Prior Fat Girl, was literally running for her life from a tornado. Thankfully she is ok, as is Carlos, and her little dog, too. Her house…has presumably looked better, but is still standing. Saturday night I’d gone to dinner with a group of bloggers that included Jen, and it is bizarre to think that something like this was less than 24 hours in her future. I’m sending out good thoughts and best wishes to her, but she might not be able to receive them until her electricity is restored. It looks like the online and real world community is rallying around her, as they should. I’m not sure at this moment if there is anything actionable recommended to help her, but you can probably check in on her web page or Twitter in the next few days to see if there’s anything more specific you can do besides sending a supportive tweet (which is probably most appreciated itself). Holy moley…. Tornadoes are scary things (I’ve been in a couple). Your friend is lucky she still has a house. I hope they’re able to restore everything quickly. Sounds like a banner weekend for you, Jen! Glad it was a good experience, open fly notwithstanding. I totally used your name generator and just secured the domain for my faux weight loss blog BaronMcBacon.com! I love Skinny Emmie! What an awesome conversation, don’t you love when that happens! btw…I use mens bathroom’s too when the woman’s re full, hey when you gotta go you gotta go…I love your style of writing ! Great post. I love the “Pudgy VonSandwich Pants” moniker. My brother called me Fatty McButterpants once – years ago and without a name-generator for help! I had the same thought about Jen/Priorfatgirl…how could we have been at dinner with her watching for the Preakness results less than 24 hours before her house was hit by a tornado? Just mind blowing.